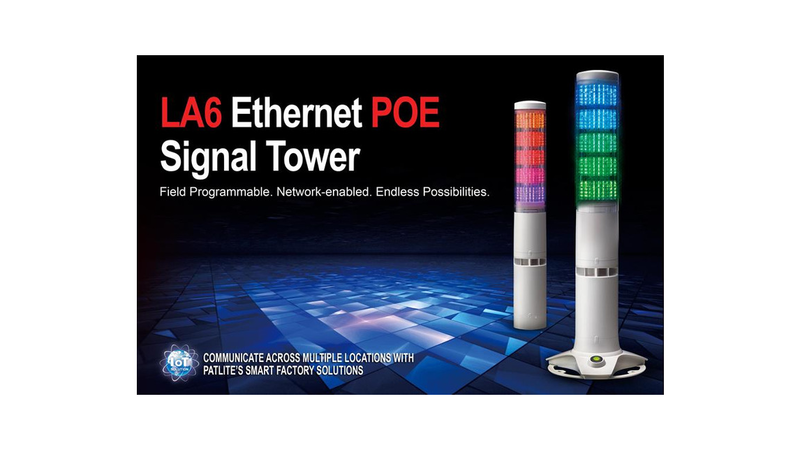 The LA6-POE is an Ethernet-enabled signal tower with PoE (Power over Ethernet). The LAN connection to PoE enables simple single-cable installation. PATLITE&apos;s LA6-POE network product solves a common remote monitoring problem: real-time monitoring of a production line from a central control room. The PoE technology enables the communication and power supply of several signal towers via a single network cable. In addition, the mirroring function visualizes the status of an entire production line from signal tower to signal tower. The LED modules can be manually configured and digitally controlled, programming by software is not necessary. With 21 possible color combinations and 11 alarm tones, the LA6-POE can be flexibly programmed for any application. With the built-in mirroring function, information like the equipment status and takt time can be communicated to other LA6-POE devices in remote locations via the LAN connection. This data can also be sent to a third party software for your data analysis or Andon monitoring.